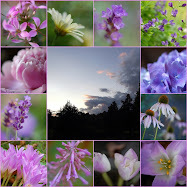 As promised, here are more photos from my visit to Willowwood Arboretum. This is the cottage garden which is situated in front of the main house. 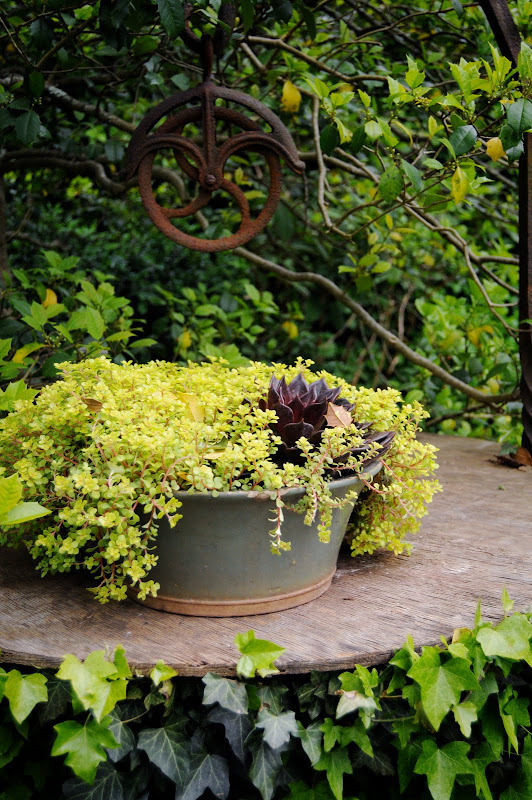 A pot of pretty succulents (above) is set on a plinth near the entrance to the cottage garden. 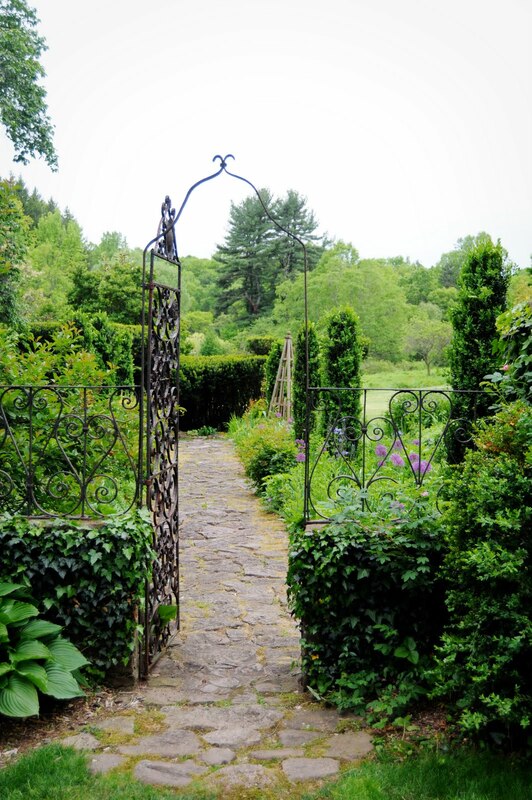 The main axis of the garden is centered on the front door of the house. 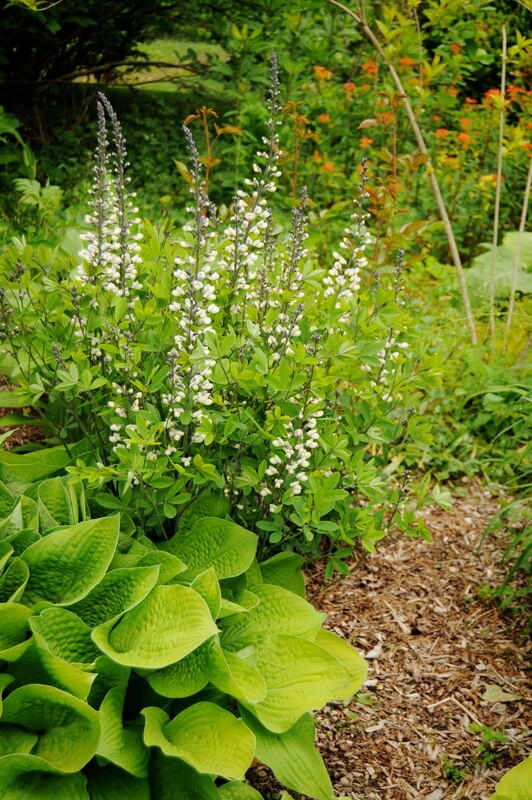 There is an allee of evergreens marching down the center of the beds, with perennials and annuals surrounding them. 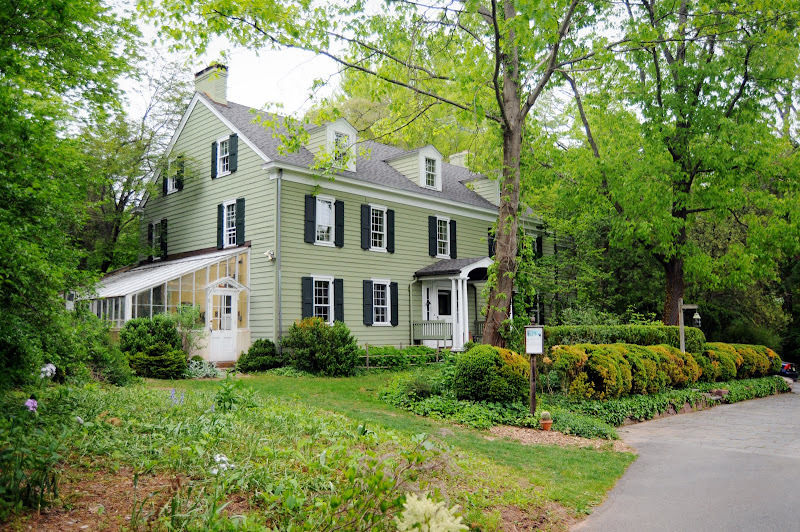 The nineteenth-century Tubbs house, with a conservatory on the left. In addition to the cottage garden in front (which is across the road you see at the bottom right of the photo), there are also gardens surrounding the sides and back. 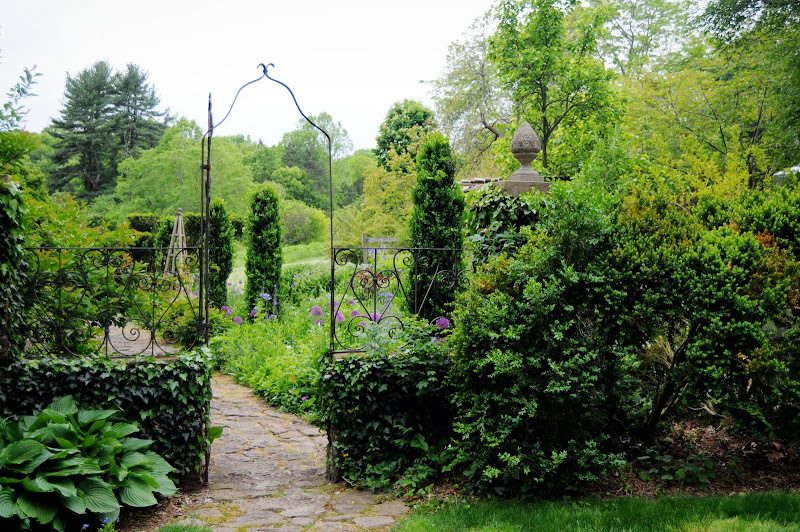 Here is another shot of the entrance to the cottage garden. Can you see the beautiful wrought iron gate? 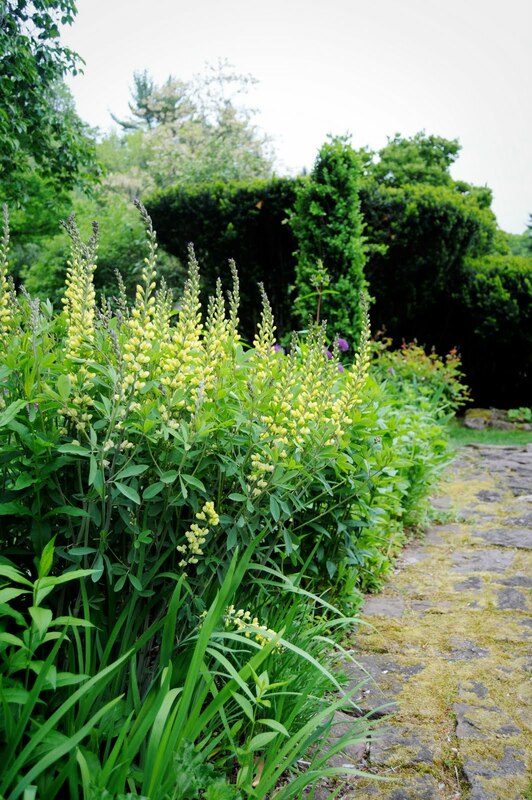 Leaning out over the central path is a beautiful specimen of yellow baptisia (above). I have seen this in purple, but never yellow. Lovely! There were some beautiful purple alliums in bloom as well. 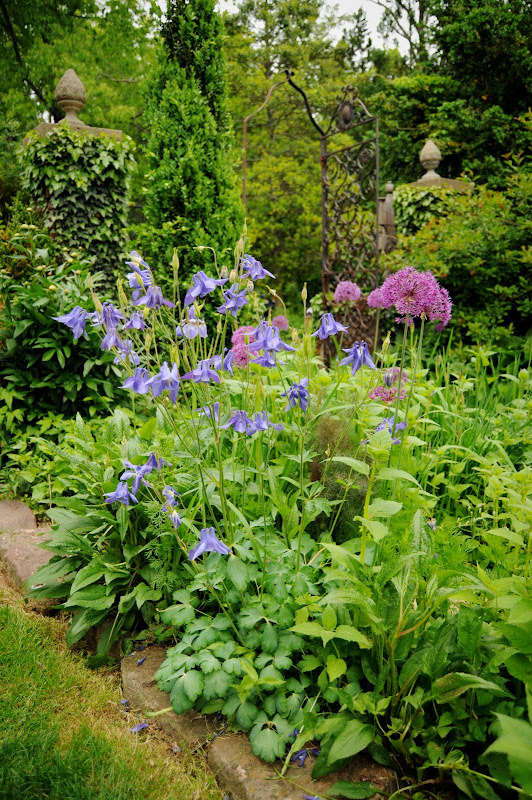 You can see the exuberant character of the cottage garden plantings here. The evergreens add structure, along with the wooden obelisk and pergola, but the billowing plants are the soul of the garden. I love these blue columbines (above and below). Blue is my favorite color in the garden. 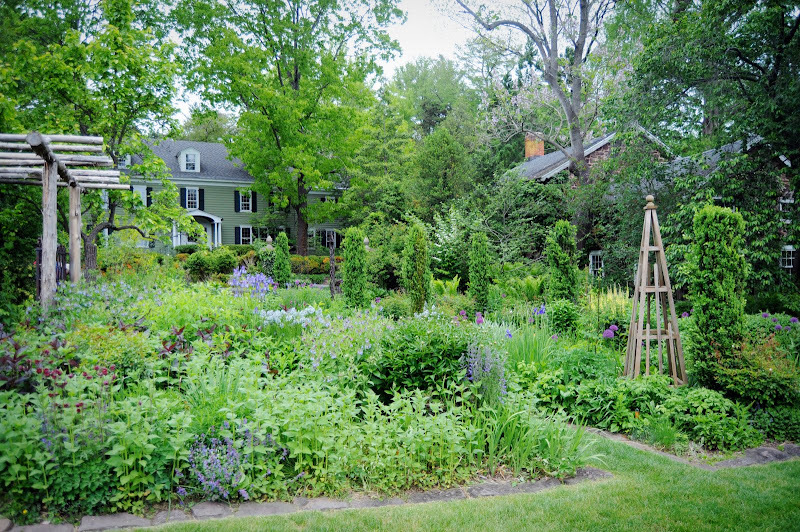 My favorite gardens are cottage style, and this one is a treat. I love that iron gate. What a lovely place to visit, and how wonderful it must have been to live there. Questi fiori sono veramente una gioia per gli occhi ! 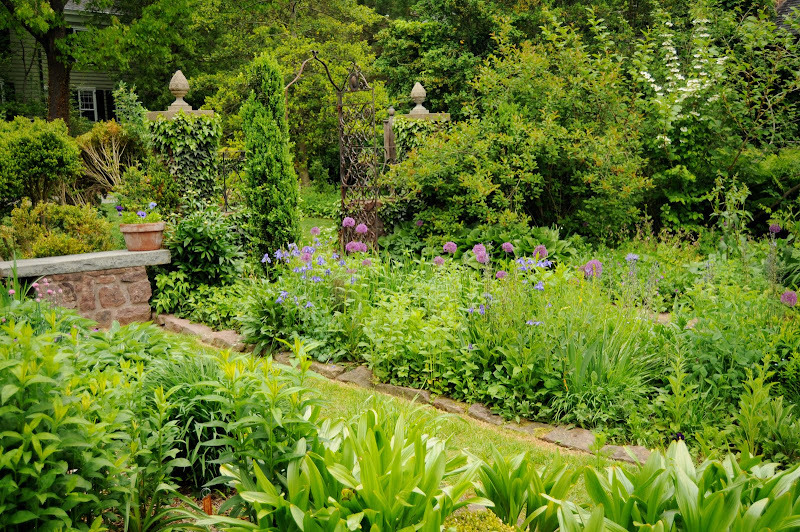 Thank you for sharing this beautiful garden! I love that gate! 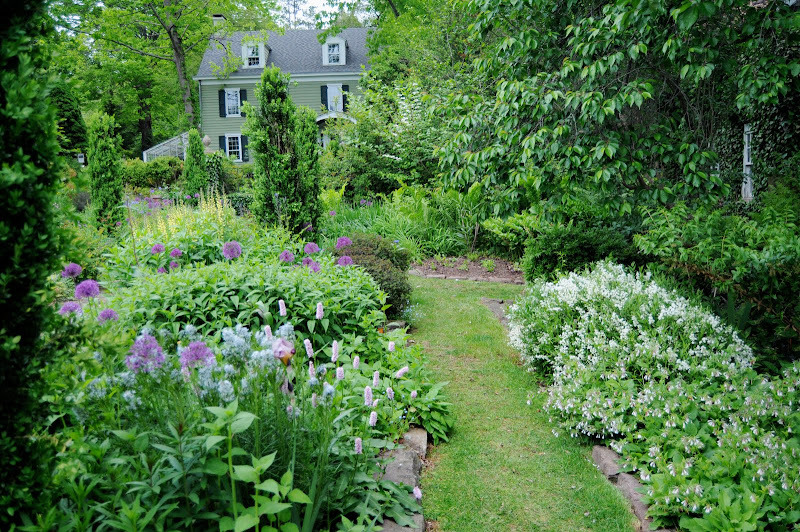 Thank you for sharing this gorgeous garden. The house is also wonderful! 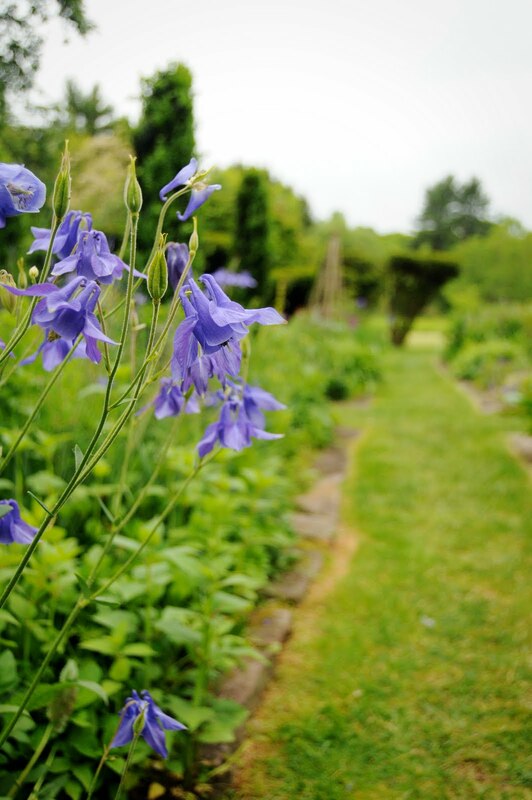 With all of the lush greens and deep purples and blues, this garden feels so meditative. That gorgeous wrought iron gate just adds to the romance of it all. Do you know, it's interesting to see the evergreens in a row. I've been thinking of doing that but am afraid of the upkeep in clipping them. I want to have something to add structure and bones to my garden (which is STILL gravel at the moment. but, I DO have a lovely stone wall that's almost finished.) 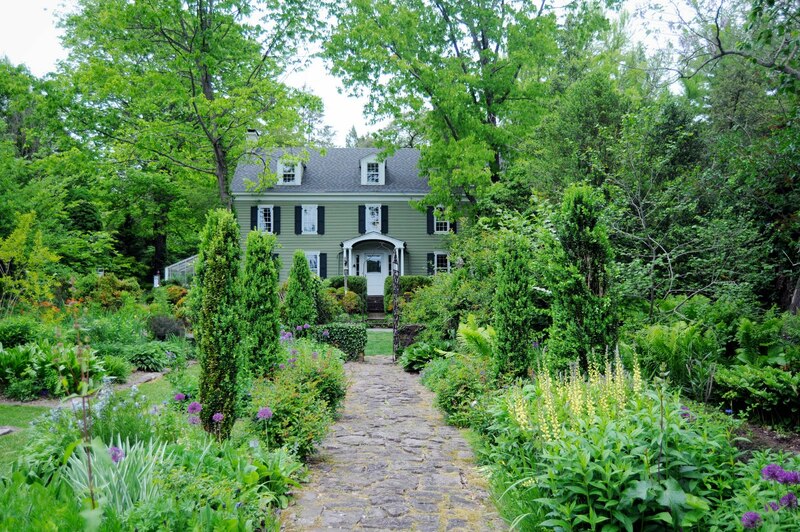 I was thinking of some arborvitae like these but am, also, afraid of the septic line that would be under the last one. Seeing these photos was VERY helpful. 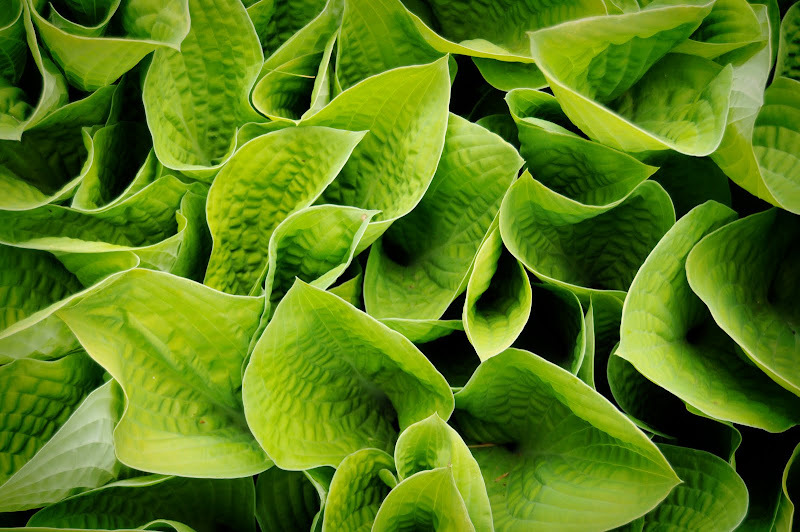 Please, share just as many pictures of the shade garden as you want!!!!!! Zakochałam się w Pani ogrodzie. Jest cudowny. Uwielbiam funkie ,orliki i łubiny. Proszę o więcej zdjęć. Oh Mary, these pictures are beautiful. Isn't photographing a beautiful hobby? A very lovely garden and the house is very charming too. The photos are so good. What great photos! So lush. Chester is beautiful in the fall as well.